New Data Brief: How much commercial capital does concessional capital leverage? Concessional capital, which can include grants (100% concessional), debt at below-market rates, or equity with asymmetrical returns, is often used in blended finance deals to draw in private investments. It does this by taking on additional risk so that the risk-return profile of an opportunity is more acceptable to commercial investors. Concessional capital is found in over 40% of deals in Convergence’s database of over 380 deals representing 2500 financial commitments. Our new Data Brief, published for our members, analyzes how much commercial capital can get leveraged by concessional capital. Using data from Convergence’s database, we analyzed trends in leverage ratios of 72 blended finance funds or fund-like structures with a tier of concessional capital within the fund structure (as opposed to other forms of concessional support such as guarantees and technical assistance sidecars). While there are many ways to calculate leverage, the Brief analyzed overall leverage as measured by the amount of commercial capital mobilized by each dollar of concessional capital, where commercial capital includes capital deployed by private investors at market rates and by public and philanthropic investors (e.g., DFIs and MDBs) at market, or near market, rates. Each dollar of concessional capital deployed to a blended finance fund mobilized $4 of commercially-priced capital, on average. The average leverage ratio for blended finance funds studied was 4.0, indicating that for every $1 of concessional capital, $4 of commercial capital was mobilized. However, leverage ratios varied significantly across blended finance funds – ranging from a minimum of 0.3 to a maximum of 22.0, with a median leverage of 2.7. Importantly, any effort to benchmark leverage ratios must be differentiated by the conditions of the transaction, including the target sector, country and impact outcomes. 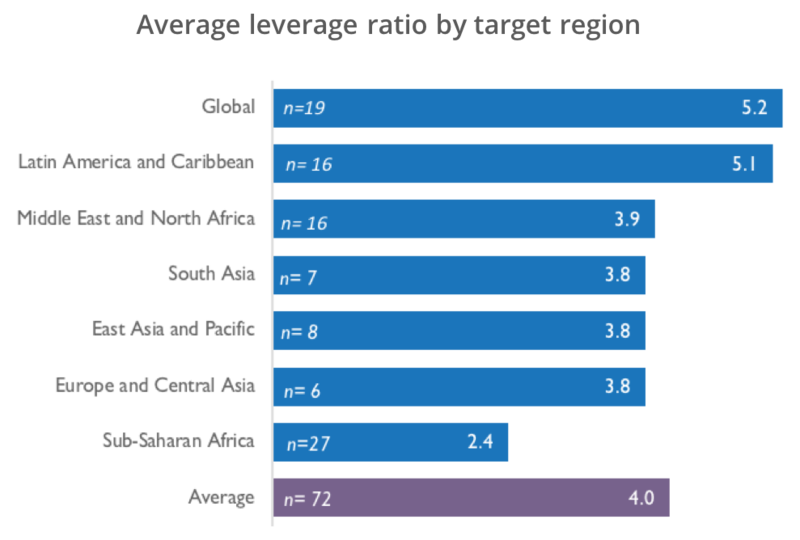 For example, deal sponsors saw larger leverage ratios, on average, for blended finance funds targeting Latin America and the Caribbean, compared to Sub-Saharan Africa. The Brief offers a preliminary effort to benchmark leverage ratios for a sample of blended finance funds. Although leverage is a key component of blended finance, leverage ratios are just one indicator of the success of blended finance transactions and should be considered alongside other conditions to avoid placing outsized focus on commercial viability over development outcomes. The Brief is part of our new data-driven series for our members that is focused on blended finance benchmarks. Each month, Convergence will publish a Data Brief and host a complementary roundtable-style webinar to promote the sharing of actionable data and learning among the blended finance community. Our next Brief will focus on SDG alignment, and identify where blended finance has the potential to play an outsized role in contributing to the SDG financing gap. 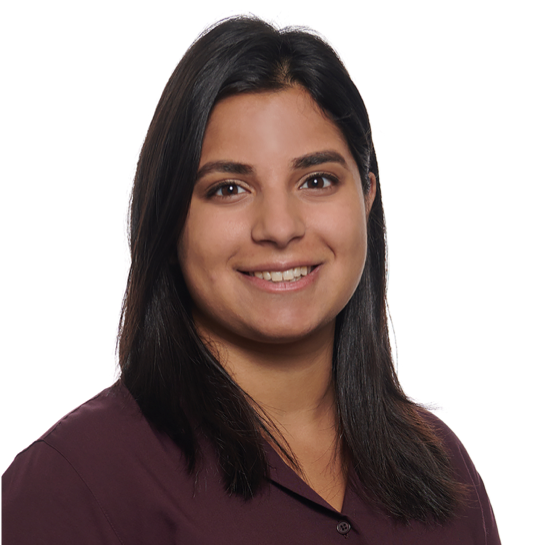 Ayesha is an Associate supporting Convergence's data and research activities, including developing case studies on blended finance transactions and working with knowledge collaborators in the development finance community. Prior to joining Convergence, Ayesha completed her Masters at the University of Toronto’s Munk School of Global Affairs. While there, her interests focused on the intersection of development and innovative finance, and included an internship at the Centre for Financial Regulation and Inclusion in Cape Town. Previously, she worked as a project consultant for Grand Challenges Canada, where she developed an M&E tool to assess the impact of their innovations one year after completing their Transition to Scale program. Ayesha holds a B.A. from McGill University in International Development Studies and Psychology.